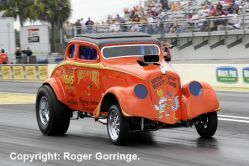 The third round of the Full Throttle Drag Racing Series contained the first round for the two wheelers, the Pro Stock Motorcycles and the fabulous NHRA Get Screened America Pro Mod Series as well as all the Sportsman categories in the Lucas Oil Drag Racing Series. It was a spectacular event that suffered almost the same weather problems that befell the first event at Pomona, hot dry, sunny conditions that developed into a cool, cloudy and rainy scenario with each attempt at track drying being thwarted by another light rain shower meaning that a lot of both Pro and Sportsman eliminations had to be run on the sunny Monday. 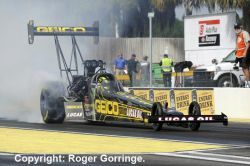 Top Fuel qualifying had three leaders during the four sessions, Tony Schumacher kicked off with a 3.851/317 only to be bounced to fourth by a 3.800/322 from Shawn Langdon but then Morgan Lucas found favour once more delivering a track record 3.766/321 in the Geico/Lucas Oil car to remain on pole. Below Lucas were Tony Schumacher with a 3.790/322, Shawn Langdon on a 3.797/323, Brandon Bernstein with a 3.813/319 and in fifth was Khalid alBalooshi with a 3.833/322 and down on bump spot was Brady Kalivoda with a 3.925/291 leaving six DNQs. 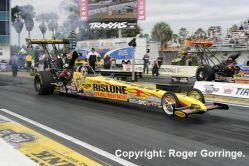 The first round saw a returning Hillary Will who managed to get to number five in qualifying go out to Spencer Massey who powered ahead, alBalooshi fell to Clay Millican’s holeshot and Brandon Bernstein’s day ended when Doug Kalitta beat him. Brady Kalivoda luckily for Mogan Lucas went up in smoke as Lucas’s chute came out and was dragged to the win from one hundred feet out. 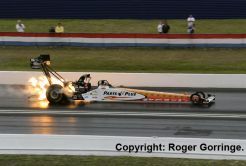 Tony Schumacher won by a half car length as Terry McMillen torched a head and lost. Shawn Langdon managed to win by a car as TJ Zizzo chased and Bob Vandergriff came from behind to beat Steve Torrence whilst last pairing saw Antron Brown bang the blower in the lights but still win as Dave Grubnic slowed before the halfway mark. 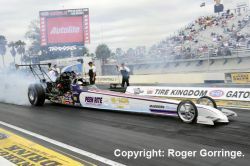 Round two was delayed a while as light rain splattered the area but Doug Kalitta beat a fireballing Clay Millican in the opening stanza, a 3.813/320 beating the slowed up 4.492/169. 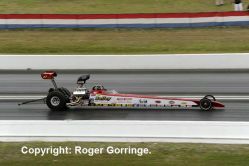 A great drag race was next as the pairing of Shawn Langdon and Bob Vandergriff ensued with hardly a hair between them on the leave, it was the 3.792/317 from Langdon that beat the 3.816/320 from Vandergriff. 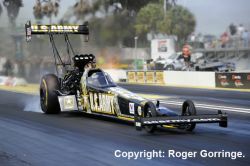 Don Schumacher teammates Tony Schumacher and Antron Brown faced off and in a reversal of recent fortunes ‘The Sarge’ Tony Schumacher got the nod, his 3.795/322 beating the 3.789/318 from Brown. The last in the round was an epic as Spencer Massey was beaten when his 3.792/321 was seen off by the third quickest ever time of 3.747/322 from Morgan Lucas. After a prolonged Sunday session of trying to dry the track as light rain sprinkled every time the track was almost dry it was all down to running the semi finals on a bright and warm Monday morning and Tony Schumacher in the U.S. ARMY car held onto his luck when a 3.791/320 beat the up in smoke off the line 11.048/69 from Shawn Langdon in the Al-Anabi machine. 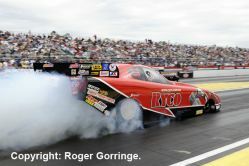 Another wire to wire race was next as Doug Kalitta in the Kalitta Air backed car faced the re-found might of Morgan Lucas in the Geico/Lucas Oil car, a holeshot 3.746/321 from Lucas beat the 3.789/320 from Kalitta. Into the final in the heat of the day and it was all done by Morgan Lucas, the Geico/Lucas Oil car chased the leave by Tony Schumacher’s U.S. ARMY machine, but Schumacher went into tyre smoke about one hundred and fifty feet into the pass, he pedalled but to no avail, a 5.289/139 came second as Lucas got the win with a fine 3.734 at a whopping 326.87mph. 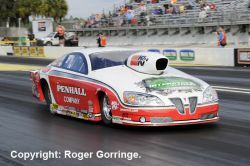 Funny Car was initially led by Mike Neff in the Castrol GTX Mustang on a 4.107/306 that was bumped up in session two to a 4.080/309 before Cruz Pedregon maxed it out in the final qualifier with a track record 4.026 at 311mph. Jack Beckman followed with a 4.047/314, then Robert Hight on a 4.057/313 and Mike Neff at 4.065/313 followed by Bob Tasca III on a 4.083/309. 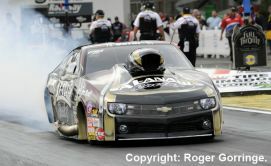 The bump spot was held by Tim Wilkerson on a 4.226/298 that left brother Tony and two others in the DNQ zone. A number of surprise first round knock-outs included Courtney Force to Ron Capps, Bob Bode to Jack Beckman, Tim Wilkerson to Cruz Pedregon, Jeff Arend to Mike Neff, Bob Tasca III to Jim Head, Blake Alexander to Robert Hight. 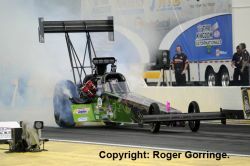 John Force went up in smoke and got crossed up just past the tree allowing Alexis DeJoria into round two and Matt Hagan the reigning Champion continued his bad luck this year going up in smoke to Johnny Gray to end the round. Round two kicked off having to contend with the light rain splatters and first up was Cruz Pedregon who seemed to slow just before the beams as Johnny Gray sped past with a winning 4.119/312 to the losing 4.163/281. 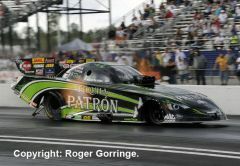 Alexis DeJoria ran a 4.135/309 but was beaten off the line by Jack Beckman whose 4.055/314 got the light. A nice tight race followed as Robert Hight ran the winning time, a 4.039/317 as Ron Capps came second with a 4.059/313 and ending the round was the dismissal of Jim Head, his 4.094/310 was beaten by the 4.076/313 from Mike Neff. 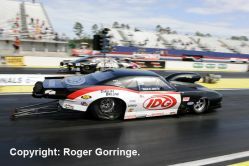 It was the Service Central Dodge Charger of Johnny Gray that managed to catch and pass the try from Castrol GTX pilot Mike Neff, a 4.054/314 to a losing 4.083/311 that opened the Monday proceedings. 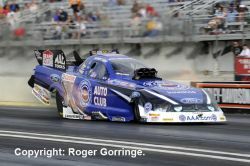 Jack Beckman in the Valvoline/Aarons Charger red lit away his chances allowing Robert Hight in the Automobile Club of Southern California Mustang the 4.044/315 win. 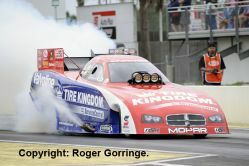 It was a John Force stable car in the shape of Robert Hight in the Automobile Club of Southern California Mustang that ruled the long weekend by taking the win, a 4.866/236 beat the up in smoke and pedalling 6.074/116 from Johnny Gray’s Service Central Dodge. Pro Stock qualifying was opened with a lead from Erica Enders in her Cagnazzi Racing ’10 Cobalt, a 6.555/210; Jason Line took up the gauntlet next with a 6.545/211 from his Summit Racing Equipment ’10 GXP before Allen Johnson came along to dominate the remaining rounds on a 6.486/211 in his Mopar/J&J Racing ’12 Avenger. 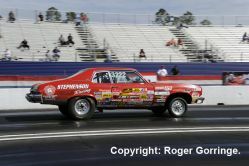 Sitting on the number sixteen was Larry Morgan with a 6.555/210 and leaving a few big names among the six DNQs remaining. There were indeed a number of big names going out in round one, Roger Brogdon to Ronnie Humphrey, Erica Enders red lit against Chris McGaha, Vincent Nobile out to Rickie Jones, Shane Gray to Mike Edwards, Jason Line defeated by Mark Martino, Allen Johnson gone courtesy of Larry Morgan, Greg Stanfield ousted by Greg Anderson and finally, Steven Kent by Ron Krisher. 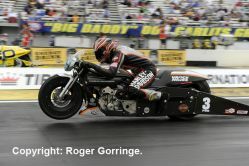 Again, proceedings were interrupted by the rain showers but round two saw Larry Morgan going out with a 6.606/209 to Ronnie Humphrey’s winning 6.572/210. Chris McGaha’s luck continued as his holeshot kept him ahead of Mark Martino, a winning 6.604/208 to a loose top end 6.604/193. 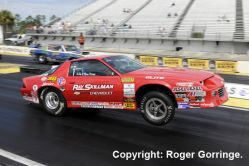 Ron Krisher came off the power at around four hundred feet out slowing to a 12.672/64 as Mike Edwards surged ahead to win with a 6.528/208 and Rickie Jones lost with a close 6.571/209 as Greg Anderson took the light with a 6.538/210 to end the round. Greg Anderson in the Summit Racing Equipment GXP gained a good light on the Monday eliminations and ended Chris McGaha’s day in the Harlow Sammons of Odessa Dodge, a shaking 14.115/59 lost to the 6.520/212. Ronnie Humphrey driving the Genuine Hot Rod Hardware GXP could not catch Mike Edwards better leave in the Penhall/K&N/Interstate GXP, a 6.521/210 beat the 6.545/211. Into the final and Mike Edwards delivered one of his stunningly quick lights and coupled it with a win of 6.566/211 as Greg Anderson tried in vain to catch up losing with a 6.538/211. 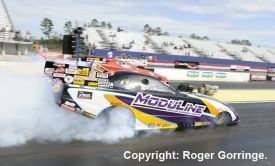 Pro Modified under the Get Screened America and Pro Care RX banner was led in the final qualifier by Mike Castellana with a 5.862/242 ahead of Danny Rowe on a 5.892/246, then Rickie Smith on a 5.911/240, Don Martin on a 5.919/245 and in fifth place Canadian Kenny Lang with a 5.942/243. Sweden’s Adam Flamholc overcame problems and managed to get the fourteenth spot. Bump spot was taken by Jay Payne with a 6.955/214. A severe tumble took place in earlier qualifying when Mike Janis crossed lanes at the top end and hit the wall ending up wrong way up but emerging just fine. Round one had wins go to Mike Knowles over Pete Faber, Leah Pruett over Steve Matusek, Canadian, Ray Commisso courtesy of Troy Coughlin, Kenny Lang over Roger Burgess, Don Martin trailering Don Walsh, Rickie Smith who took out Adam Flamholc, Danny Rowe beating Ike Maier and Mike Castellana beating Jay Payne. 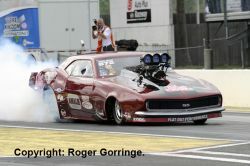 In the second round Rickie Smith took the win with a 5.887/240 as Ray Commisso slowed from about four hundred feet. 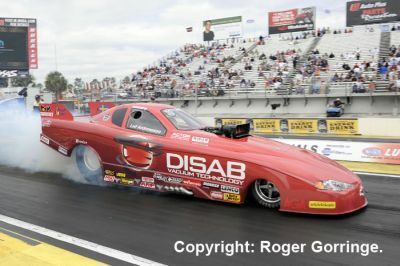 Mike Knowles’ 5.922/241 was beaten by the 5.810/246 from Mike Castellana. Don Martin managed a holeshot coupled with a winning 5.978/236 as Kenny Lang lost with an off the power 7.997/119. 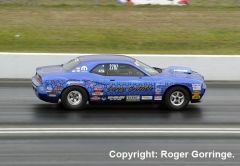 A neat leave by Leah Pruett secured her a 5.895/251 win in downing the 5.908/244 from Danny Rowe. 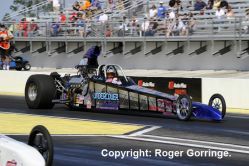 The semis were run on the Monday due to the rain and featured Rickie Smith whose 5.926/239 won in the bout with Leah Pruett whose 5.919/251. Don Martin red lit away his chances allowing Mike Castellana a 6.437/232 win. The final had Rickie Smith in his IDG ’12 Camaro overcome the great light from Mike Castellana’s Al-Anabi Racing Camaro, a 5.913/240 beat the faultering 6.435/189. 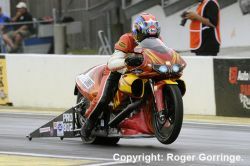 Pro Stock Motorcycle was an Eddie Krawiec weekend and what a debut for the bike field as he led qualifying with a 6.863/197 followed by a 6.824/196 before securing the pole for the whole event with a track and national record ET of 6.750 at 198.03mph and leaving everyone else bobbing along in his wake. Young Hector Arana III was second with a 6.812/193, Andrew Hines a third with a 6.834/194, Hector Arana Sr. in fourth with a 6.842/193 and in fifth Matt Smith on a 6.881/191 and down in sixteenth place was Sweden’s Ulf Ögge with a 7.034/187 leaving nine riders in the DNQ field. Round one saw the disappearance of Steve Johnson to Scotty Pollacheck, Shawn Gann to Karen Stoffer, Gerald Savoie to LE Tonglet, John Hall to Andrew Hines, Michael Phillips courtesy of Hector Arana Jr. Ulf Ögge went out to the sheer power of Eddie Krawiec, Jim Underdahl trailered by Hector Arana Sr. and Joey Gladstone ousted by Matt Smith. Into the second round and Karen Stoffer fell victim to Hector Arana Jr. a 6.878/188 beat the better leaving 6.992/188. An amusing set was created next as Hector Arana Sr faced Matt Smith in a staging duel that was ended by the starter as he told them to back out, cool off and run as the last pair in the round, it ended with Smith getting the 6.915/191 win to the 7.218/164 lose. Andrew Hines caught and passed the leave from LE Tonglet, a 6.848/196 beating the 6.895/191, and Eddie Krawiec trounced Scotty Pollacheck with a 6.761/199 to the losing 6.998/186. The semis had to be run on the Monday as the persistent rain showers did not allow proceedings on Sunday, Andrew Hines on his Screamin’ Eagle Vance & Hines HD V-Rod managed to quickly catch and pass Hector Arana Jr. on his Lucas Oil Products Buell, a 6.781/197 beating the slowing 7.144/155. 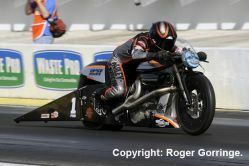 Matt Smith left first on his self financed Buell but was chased down by Eddie Krawiec on his Screamin’ Eagle Vance & Hines HD V-Rod, a game 6.861/192 was not good enough as Krawiec nipped past in the lights with a 6.767/198. The finals was a team battle as both the Screamin’ Eagle Vance & Hines machines faced off, Hines was out of the box first but his 6.861/194 was reeled in and beaten by Eddie Krawiec’s 6.822/194. 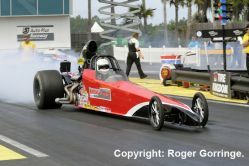 Top Alcohol Dragster came down to a race between Chris Demke in his Peen-Rite/Cleanboost Oil blown dragster and the A/Fuel Bar’s Leaks/Rislone machine of Bill Reichert, Demke’s holeshot together with a 5.306/271 secured the win as Reichert followed with a losing 5.318/265. 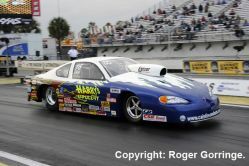 Top Alcohol Funny Car had Mickey Ferro in the Ryco Hydraulics ’08 Monte Carlo take on Paul Gill in his Moduline Modular Aluminum Cabinets ’08 Mustang,and a better leave by Ferro kept ahead securing the win in a time of 5.550/258 to the losing 5.601/250. Competition Eliminator saw a battle between a dragster and a doorslammer, the dragster of Robert Bailey succeeded with a 7.113/142 win as the ’09 Pontiac of Calvin Hill red lit away his chances. The Super Stock win went to Dave Rampy in the ’89 Camaro, a 10.250/120 beat the breakout 8.499/156 from Joe Teuton’s ’68 Barracuda. The Stock Eliminator title went to Charlie Fitzsimmons in his ’10 Dodge, a 9.928/122 got the better of the 12.098/104 from Chris Stephenson’s ’74 Apollo. 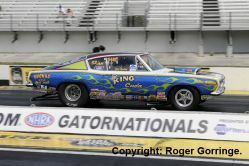 Super Comp was won by Todd Ewing with an 8.933/169 as the 8.915/185 from Frank Altilio came in second. 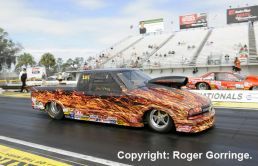 Super Gas was a double breakout with the win being awarded to the 9.879/154 from Jim Perry in his ’00 S-10 truck as the 9.814/151 from Rich Price in his ’96 Beretta came second.